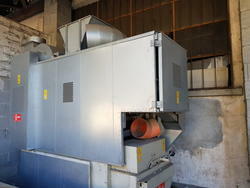 Bankruptcy asset sales of used seed processing equipment. Make your bid! If you are looking for some cheap used seed processing equipment, take a look at the auctions published on this section. You will find a wide selection of lots, sold at attractive prices. All the items come from bankruptcy procedures and company liquidations; this results in a price much lower than what can be obtained for the sale in the normal market. Find the best used seed treater in just a few clicks: you can easily filter the results by price or discount rate to show only the lots in line with your budget. To attend the auctions, register for free and make your bid directly online. Depending on your needs, you can bid manually or use our automatic raise system. Automatic mode is especially useful if you don't have too much time to spend on following the auctions: just set the maximum price you are willing to pay, and then the system will raise your bid on your behalf, accordingly. Attend our online auctions of used seed processing equipment and get the best for your business. Hurry up, the cheapest used seed treater is just a few clicks away! Do you want to stay updated about the upcoming auctions of used seed treaters? Subscribe to our newsletter! You will receive a weekly email showing new items for sale.